With its restructuring expenses largely behind it ($55.3 million since February 2016) and net sales up 19.5% for the quarter ended June 30 compared to the same quarter last year, Deckers reported a good result. Sanuk continues to be the laggard, and I still won’t be surprised to see Deckers management sell the brand, though for orders of magnitude less than they paid for it. Revenue rose to $251 million from $210 million in last year’s quarter. The chart below compares revenues for both quarters and shows the percentage change for each brand. Also included is the breakdown between international and U.S. revenues. SG&A expenses fell from 70% to 61.6% of revenue while growing in dollars from $147 to $154 million. The pretax loss declined 30.9% from $56.6 to $39.1 million. The net loss fell from $42.1 to $30.4 million, or by 27.8%. Note that about $10 million of revenue was shipped early and had been expected to be part of the current quarter. The question is whether that means the current quarter’s revenue will be $10 million below what it would otherwise have been. There were also “certain operating expenses” shifted to the current quarter. They don’t say how much. Remember that corporate tax rates are lower this year. As with other companies, this is Deckers’ weakest quarter. Below is a table showing the operating income by brand and the change from last year’s quarter. Note that all the brands are up except poor Sanuk. Deckers also has some work to do on its direct to consumer business and has been busily rationalizing its brick and mortar footprint, and this may lead to some further charges. They make a comment that Sanuk’s lower operating profit was the result of lower sales offset by higher gross margins. Hopefully, that’s in indication of distribution getting cleaner. The balance sheet is solid, and I’d note a small inventory decrease from $442 to $436 million even with the sales increase. I love the turnaround in cash from operations. It was a negative $7.35 million in last year’s quarter. It’s a positive $8.07 million in this year’s. There’s a lot of that kind of distribution consolidation going on. Advantage, big players. Deckers is continuing to rationalize its brick and mortar business. I’d feel better if I heard them talk more about how they are tying it to ecommerce. Higher sales with a higher gross margin, improved distribution, and lower SG&A as a percent of revenues is a good thing. Sanuk is a bit of a fly in the ointment and I wonder if its potential justifies it being part of a public company. For the year and quarter ended March 31, Deckers improved its results as discussed below. Related to that improvement is the progress of its restructuring and operating profit improvement plans. As we review these results, we’ll see that Deckers is confronting the same issues other brands/retailers are confronting as the internet changes the role of stores and the way people shop. In the year ended March 31, Deckers reported a revenue increase of 6.3% from $1.79 to $1.903 billion. The UGG brand, at $1.507 billion for the year, represented 79.2% of Decker’ total revenues. Sanuk’s revenues fell slightly from $91.8 to $90.9 million. The brand’s wholesale revenue rose from $77.6 to $78.3 million. Direct to consumer fell from $14.2 to $12.6 million. Just to put that into perspective, Sanuk’s wholesale revenues by themselves, for the year ended December 31, 2013 were $94.4 million. I’ve got no problem at all with revenue stalling if it means a higher gross margin and cleaner, more appropriate, distribution. That’s how you build, or I guess I mean rebuild, the brand. What took them so long? Sanuk’s operating profit on its wholesale business only was $14.5 million, up from a loss of $110.6 million the previous year. As explained in the 10K, “The increase in income from operations of Sanuk brand wholesale was primarily due to impairment charges for goodwill and long-lived assets incurred in the prior period, as well as higher sales at higher gross margins in the current period.” For none of their brands do they give an operating profit that includes direct to consumer. At best, it would be very difficult to calculate- probably meaningless. SG&A expenses declined 15.3% from $837 to $709 million and, as a percent of revenue, from 46.8% to 37.3%. BUT that includes $118 million of Sanuk related impairment charges from the previous year. Total impairment and depreciation charges last year were $138 million. For the March 31 quarter, revenue rose 8.7% from $369 million in last year’s quarter to $401 million. The gross profit margin rose from 43% to 48%. CFO Thomas George tells us in the conference call that the increase “…was largely due to fewer closeout sales and an improved promotional environment in the quarter, which contributed 160 basis points, continued realization of significant progress on our supply chain improvements worth approximately 170 basis points and 120 basis points from FX, with the balance being driven by favorable channel mix.” Again, it’s important to recognize how much of the improvement was the result of factors out of Deckers’ control. Last year’s quarter had a loss of %15.7 million. In this year’s, net income was a positive $20.6 million. Last year’s quarter included restructuring charges of $29 million. Comparable charges this year were $1.7 million. Starting in February 2016, Deckers implemented, and continues to implement, a restructuring and, a year later, an operating profit improvement plan. The goal of the restructuring plan is to “…streamline brand operations, reduce overhead costs, create operating efficiencies and improve collaboration.” The operating profit improvement is to come from “…reducing product development cycle times, optimizing material yields, consolidating our factory base, and continuing to move product manufacturing outside of China.” As they describe it, the plans are working with the savings and improvements already significant. One of their risk factors is about opening retail stores. It says, “It may be difficult to identify new retail store locations that meet our requirements, and any new retail stores may not realize returns on our investments.” Risk Factors have tended to become blinding glimpses of the obvious, so that’s fine. However, the discussion of this factor takes a business as usual approach to store opening decisions; no mention of ecommerce. Maybe some retailers need a new risk factor: “If we don’t figure out how to think about and manage our stores and ecommerce as if they are one and the same, we’re screwed!” Probably some lawyer will stop them from putting it quite that way. Let me go on and quote for you some of their Trends Impacting Our Overall Business. All I know, of course, is what I read in the SEC filings and conference call transcripts. Perhaps their ongoing reduction in stores is their thought-out response to the integration of ecommerce with brick and mortar, but I can’t tell that from the information I have available. What I want you to take away from the above discussion about their brick and mortar strategy and risk factors is that while they give lip service to the integration of brick and mortar and ecommerce, they don’t give us much information on just how their “fleet optimization strategy” relates to their ecommerce strategy. You know I love that approach. But from Deckers, and from any retailer by the way, I need to know what exactly the “optimization” of their brick and mortar footprint means. When a retailer finally starts to talk in some detail about how brick and mortar and ecommerce are one revenue stream, I know they’re making progress. One can’t help but ask why, if Deckers doesn’t want to own these stores because of “changes in the retail environment,” the potential partners will. Perhaps that suggests these will mostly be store closures. I’ve reviewed Deckers’ 10Q for the three months ended December 31, 2016 and their conference call. The company earned $41 million on sales of $760 million in the quarter, which isn’t bad. But that’s down from net income of $157 million on revenues of $796 million in the same quarter last year. The problem? I’m sure regular readers already know. Yup, it’s mostly Sanuk again. But’s let start at the company’s top line. http://www.jeffharbaugh.com/wp-content/uploads/2014/08/logo_color_640.gif 0 0 jeff http://www.jeffharbaugh.com/wp-content/uploads/2014/08/logo_color_640.gif jeff2017-02-13 08:17:172017-02-13 08:18:00Deckers’ Quarter: More Sanuk Travails and the Public Company Conundrum. Deckers, as you know, owns Ugg, Teva, and Hoka as well as Sanuk and some other smaller brands. Their second quarter kind of reflected the economic and competitive conditions we’re seeing as most companies report their results. However, Deckers is making a solid overall profit. Total revenue at $485.9 million didn’t change much. It was $1 million higher than last year’s quarter. Contrary to what we’re seeing in other companies, U.S. business rose $312.3 million, up from $301.5 million. International fell from $185.3 to $173.7 million. 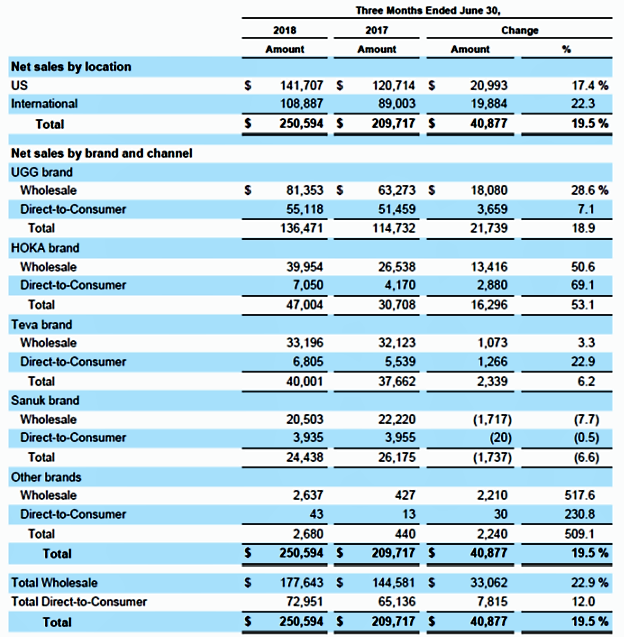 Wholesale revenues were $400 million and direct to consumer $86.0 million, both down very slightly. This is the first earnings release and conference call since Dave Powers, who was previously President, took over as CEO from Angel Martinez at the end of May. He steps into the position at a time when Deckers, as well as other brands and retailers, are suffering from general economic conditions and the continuing growth of online. Deckers’ sales for the quarter fell 18.4% from $214 million in last year’s quarter to $174 million in this years.